The Yonaga owed its existence to factional disputes amongst the Japanese Naval hierarchy over how best to bring an enemy navy to a "Decisive Battle" and defeat him soundly. In the late 1930's, large-caliber naval artillery aboard heavily-armored ships was still considered the arbiter of naval battles, but the growing ship-killing capabilities of the airplane, even single-engined ones aboard aircraft carriers, created a rival faction of adherents. Limited shipbuilding resources created strident arguments over where to place the faith in composing a victorious fleet of the future. Could size and quality trump quantity? The looming tensions with Western powers, who had their own large carriers, made war in the near future a strong possibility so a few shipbuilding 'deals' were made by the 'big gun' and 'fleet air' factions. In the mid-thirties the British and Americans already had fast, giant aircraft carriers (HMS Incomparable and the USS Lexingtons) converted from battlecruisers, but the best Japan could do was the slower and less spectacular Akagi. When Japan started building the three super-battleships of the Satsuma class (70,000+ tons, 6 20" guns) in 1938, delays in securing sufficient quantities of heavy armor plate stalled progress. Rather than let the slipway remain idle, the carrier faction seized upon the opportunity to assert their will and build the world's largest and most powerful CV. When she worked-up just prior to the Hawaiian Operation, she had the largest aircraft complement of any carrier afloat in the world. Because of Yonaga's size and accommodation, two new aircraft concepts were tried out--the 'strategic reconnaissance plane' and the 'strategic fighter'. To better enable analysis of battlefield results, a speedy, long-endurance reconnaissance plane, the C6Y "Yamagumo", could linger over the battlefield, evade interception, and provide feedback to the mother carrier for the follow-up strike, something the typically dowdy floatplane scouts could not do while furtively trying to keep from getting shot down. Three were carried to provide an unbroken stream of information as they traded off overflight duties. In addition to the 'standard' complement of 27 each of dive, torpedo, and fighter aircraft such as the Shokaku carried, an additional 18 twin-engined, fast, heavily-armed MA6M "Misago"s (known as the "twin-engined Zero") were carried to sweep away or disrupt the enemy's air defense minutes prior to the attack group's arrival. The Yamagumo's inline V-12 engine required special 100-octane fuels that were ill-advisedly stored in barrels on the hangar deck, and the Misago's twin engines required twice the normal maintenance of other aircraft, making these two aircraft unpopular with the service crews despite their battlefield potential. Yonaga and Owari (another BC conversion just completing) formed the 7th Carrier Division. Fleet Admiral Chuichi Nagumo, in charge of the Hawaiian operation, was tempted to fly his flag aboard her, but preferred the China Incident veteran Akagi, leaving Rear Admiral Tamon Yamaguchi to command CarDiv 7. Yonaga took aboard relatively inexperienced aircrews to Hawaii, along with the first air search radar aboard a Japanese ship. Yonaga's were the first Japanese aircraft over Hawaii, but her attack aircraft were only allowed to work over the 'easier' land targets and were the first aircraft to return to the Fleet. Yonaga's primitive radar duly noted the returning aircraft but without IFF could not know that two American scout bombers from USS Constellation (undetected at sea) had boldly followed the air group back and mingled in the approach pattern. They attacked Yonaga just as she was launching her second wave and, using the giant Hinomaru painted on her forward flight deck as an aiming point, blew out her forward elevator. The bombs hit the barrels of 100-octane avgas, starting vicious fires that swept backwards, enveloping the entire carrier deck with thick, black smoke. The scouts reported the carrier aflame from end to end and presumably sunk. Yonaga pulled out of line and made a hasty 180-degree turn, then reversed at flank speed to prevent wind-driven flames from engulfing the ship and to stay with the Fleet despite the reduced speed. Plane handlers frantically turned 48 aircraft around to launch them into the wind off the stern, now cleared of smoke. The next American attack sank the giant carrier but they erroneously reported it as an entirely different one because it now had a 'starboard' island. Admiral Yamaguchi was barely persuaded by his pleading staff to forego going down with his ship, as there would be a long war to fight, but vowed that he would not suffer such humiliation again. Though Yonaga's loss was a great blow to the Japanese, the four American CV's reported sunk off Hawaii (actually only two, plus one severely damaged, plus the target-ship Utah mistaken for a carrier with her reinforced deck planking) and the destruction of other surface ships gave rise to a fatal optimism for the Japanese. Most large CV's built thereafter had armored decks but couldn't handle more than 65 aircraft, so Yonaga remains the most powerful aircraft carrier ever built by the Japanese. Admiral's note: Yonaga was inspired by Peter Albano's book The Seventh Carrier about a similar fictional carrier having armored decks and 125 aircraft that got trapped in an ice cave just before the Hawaiian Operation and didn't get thawed out until 1981 to complete her mission as assigned 40 years before!! Albano's pre-war Yonaga would have surpassed the capabilities of even the post-war USS Midway class. Because that ship would have been too advanced even for my Grand Fleet assumptions, I toned down my Yonaga to meet a more reasonable Japanese capability. Admiral Furashita is also a model-maker, and inevitably some of my two-dimensional Fleet creations would find their way into 3D plastic. Offered below are some pictures of those models. 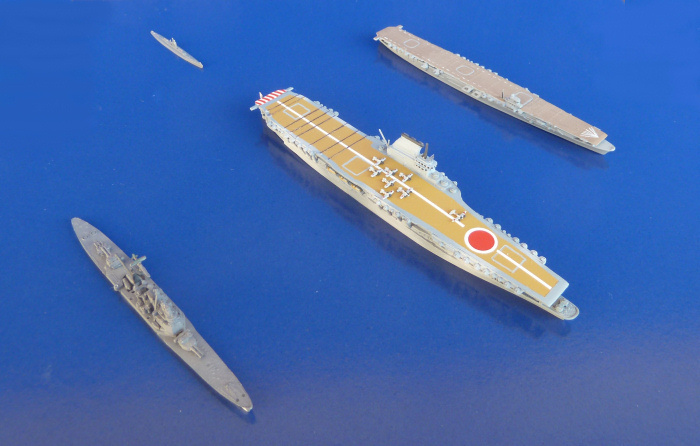 Here is a 1/2000-scale Yonaga alongside the Shokaku (and Chichibu) for size comparison. I scratch-built two "Misagos" (you wouldn't BELIEVE how tiny those aircraft are in this scale!) on the deck with some "Zeroes". My "Yamagumo" reconnaisance plane is basically a hopped-up, single-seat "Judy" whose similar real-world "cousins" were first carried aboard the Soryu at Midway, and were indeed the fastest aircraft in Pacific skies. About a year later the two-place "Judy" became the standard IJN dive bomber. My Yamagumo sports the "stealth" Hinomarus that "identify" the aircraft as Japanese with VERY low visibility, so as not to be easily seen as they scouted Pearl Harbor. 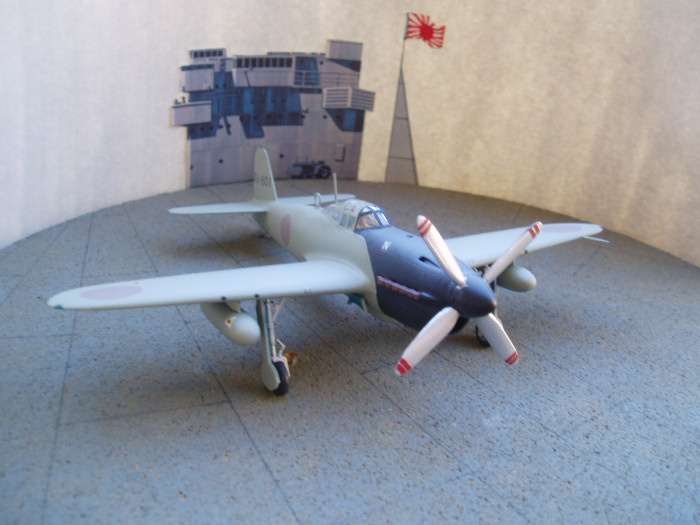 Here is the "Twin-engined Zero" I call the MA6M "Misago". 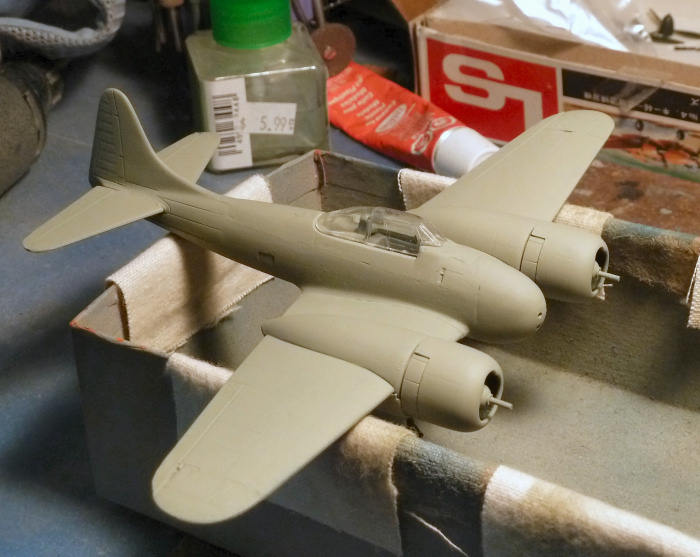 I finished the actual model in Thai camouflage and markings, but this in-progress shot with gray primer paint approximates the look of an early-war IJN aircraft (just imagine the Hinomarus on the wings and fuselage!) such as would be aboard the Yonaga at Pearl Harbor!